The Lowe Family News: Warning: This is scary. Why didn't anyone TELL me I had mascara ALL over my face? You KNOW Jake and Kora were laughin their HEADS off walkin to the bus stop. before school saying, "Have a nice day kids!!!" ...here's some sweet video of my Isaak making his monster noise, one of his many new talents. He also loves to clap and give high fives, but that's not in the video. Oh and I'm sorry it gets cut off at the end, my battery died (yes Laura...again). "Beauty and the Beast", Issak being the beauty, of course -- he's such a cutey. Jessica, luv, you could wear a burlap bag and don a green facial mask and you'd still be scary gorgeous. We miss the Lowe Lot gobs. marian!! i thought you were gonna get on to me for sleeping in my makeup. i usually take it off...i was just soooo tired last night. honestly though, whenever i'm putting on makeup or taking it off or even THINK to touch my face i always hear your voice in my head reminding me of beauty tips on how to stay looking young and hot. i'm not kidding, i've never forgotten everything you've said to me!!! isn't that funny?! Ah, I love his monster sounds! He's getting so big! Whatever! You just want all of us to comment on how beautiful you are...which of course you are!!!! But I could smell your stinky breath through the computer!!! Or maybe that is just mine bouncing off my computer screen back into my face?!? Not sure?!?! Anyways, Izey is such a little lion cub! Love it!!! I agree with the rest, you are still gorgeous with all that black schmuck on your face, lol. I bet the kids just thought it was nothing. And I love the monster sounds, TOO CUTE!! your skin looks really good in that picture... did you photoshop it? hah.. and i think izey gets that growl from you.. i keep growling at lucas and he's beginning to catch on... i think he'll be a roarer too. it's so precious. My main man Iz sounds cool. And I agree.. no amount of mascara on your face makes you any less gorgeous! I loved that growl. Do you take requests on your blog? I would like to make a request. Could I see more Jakob...I miss him and he is hardly ever on the blog anymore. I thought since I was Mutha you would do that for me. 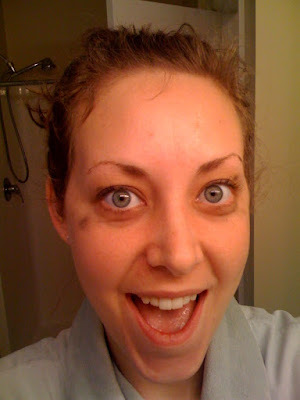 Just kidding, you're pretty enough that a little mascara on your face is no biggie. LOVE the growling. He's so precious! oh my goodness!! You know that comment you left up above to you aunt? Well...I always remember your very strict clinique skin regimen and your aversion to touching your face at all. Somehow I think you transferred your skin fears over to me...because I always remember you and how I shouldn't touch my face with my dirty fingers...LOL!! Aaaaand poor Izey he looks scared, you probably threatened him if he didn't perform for the camera...LOL! I'm juuuust kidding, he is still the coolest baby around!